SYDNEY (CNS) — In March, as Anna Corry lay dying, she sent out a request to speak publicly about her opposition to euthanasia. The 50-year-old former nursing educator had endured an aggressive type of breast cancer since her diagnosis in January 2016. This January, she and her husband, Martin, a paramedic, and their sons Michael, 17, Dominic, 14, and Andrew, 11, received the news that although chemotherapy had shrunk the 10-cm tumor near her heart, the cancer had spread through her body. She died Holy Thursday, March 29, but not before the parishioner of St. Bernadette’s in suburban Castle Hill shared her thoughts on euthanasia and assisted suicide with The Catholic Weekly, newspaper of the Archdiocese of Sydney. Corry told the paper she believes opting to shorten her own life would have robbed herself, her family and friends of “an incredible amount of joy” during her final weeks. Some say churches should stay out of the debate around dying and the law, and that the terminally ill themselves should have more say; Corry said she discovered, through her own experience, arguments against legalizing euthanasia that are quite apart from her Catholic faith. “If I had told my children I was potentially looking at euthanasia, they would feel robbed of a mother for weeks or months that they could have had, and it could have created a lot of anger within them. 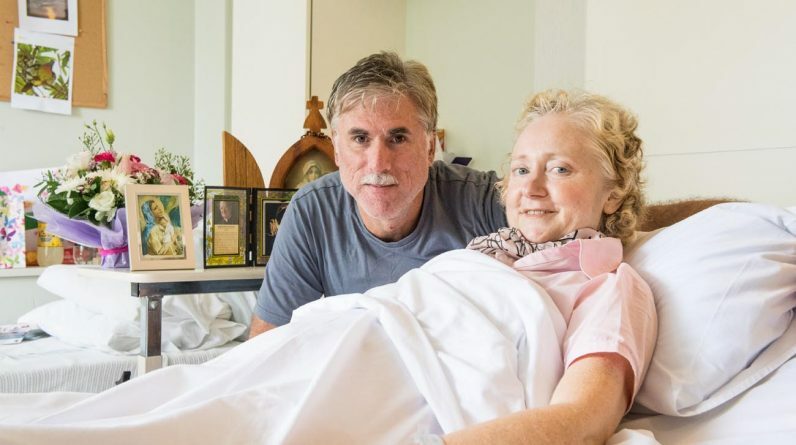 Corry left her home in Cherrybrook in Sydney’s northwest for a bright and spacious room at Neringah Hospital, a palliative care facility in Wahroonga, where she received many visitors, including friends who came to pray with her each day. She said she understands the fear of a terminal disease’s progression, including the loss of independence and physical discomfort. “A diagnosis of a terminal illness can be an enormous strain of stress and fear on a person and the family,” she said, but added there is no reason to fear unbearable pain at the end of life. She said she believes a desire for euthanasia can sometimes indicate a lack of healthy self-love. “A lot of people don’t feel they deserve to have their family look after them. I’ve heard that a lot of people who … don’t want to burden their family; they feel lonely, they are disconnected from their family. “It’s more about emotional pain in my view, not so much physical pain,” she added. Corry told The Catholic Weekly her journey with cancer included intense “peaks and troughs” physically and spiritually. And she said she had to work through anger, anxiety, and heartbreak at having to leave her children. But she also expressed gratitude for her disease, which she said enriched her marriage and taught her the value of friendship and generosity as well as a deeper appreciation of time. “I didn’t know that a marriage could be so happy until now,” she said. “It’s given my husband an opportunity to serve me in a way that he’s never ever done before, and we love each other now more than ever,” she said. “It’s a very deep love, it’s a very personal love, and I guess it’s a little bit fearful because we won’t be with each other, or at least communicating with each other in a human sense. “(Though) we will through prayer,” she added. Hundreds of Corry’s friends and family were praying for a physical cure as well as a spiritual cure of being able to accept whatever God’s will would be for her. She said the second request had been granted. “Just before I came into (this) hospital I started to trust Our Lord, and I started to feel a peace and joy that I’ve never felt before, and an acceptance of his will,” she said. Rodrigues is a Sydney-based writer and mother of five who writes for The Catholic Weekly.